Canon's latest high-end compact comes with an electronic viewfinder and extensive external controls to boost its appeal for enthusiasts. It's good to see viewfinders returning to compact cameras – it makes composing images in bright light much easier. 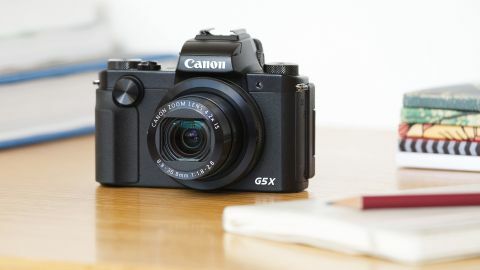 The G5 X is an excellent compact camera for anyone looking for a first 'serious' camera or a back-up to an SLR or CSC, but it's not one that you can slip in your jeans pocket. The G5 X was launched at the same time as two other new cameras – the G9 X and the mirrorless EOS M10. The G5 X is potentially the most interesting, though, because it offers enthusiast oriented controls in a pocket-size camera with an electronic viewfinder. For anyone familiar with Canon's high-end PowerShot range, the G5 X can perhaps be considered a true successor to the G16 model, as the other G range models don't quite match the G16's size, shape and intended audience. It sits in the middle of the new G range of cameras, above the G9 X and G7 X, but below the G1 X Mark II (bigger sensor) and the G3 X (longer zoom). The G5 X looks a bit like a DSLR but actually it's a lot smaller. Inside the G5 X (and the G9 X, launched at the same time), is the same 20.2 million-pixel back-illuminated 1-inch type sensor found in the Canon G7 X, which impressed us when we tested it in 2014. As in the G7 X, this sensor is coupled with a Digic 6 processor and sensitivity may be set in the range ISO 125-12,800. The G5 X also has the same lens as the G7 X, a 4x zoom with a focal range equivalent to 24-100mm and a maximum aperture range of f/1.8-2.8, which ensures reasonable control over depth of field. In a significant difference from the G7 X, however, the G5 X has an electronic viewfinder (EVF) built-in. This is a 0.39-inch type OLED device with 2.36 million dots and it shows 100% of the scene that will be captured. The EVF also has a refresh rate of 120fps, which means there's little lag, making it easier to follow moving subjects. The lens is the same 4.2x zoom found on the Canon G7 X.
Canon has also given the PowerShot G5 X a 3-inch 1,040,000-dot touch sensitive screen that's mounted on a vari-angle hinge to make it easier to compose images in either upright or landscape format at high or low angles. Further good news is that like other G-series cameras, the G5 X offers advanced exposure control with aperture priority, shutter priority and manual mode, as well as a collection of scene modes and automatic options. Raw format shooting is also available and there's stabilisation built-in to help produce sharp images as light levels fall. For beginners, and those who want to dip their toes into video shooting, there's Hybrid Auto mode, which shoots two seconds of video before each shot is taken, compiling them together at the end of the day as a 'digest' movie. There's also a Creative Shot mode which shoots an image and then applies five different crops, digital filters, or a combination thereof. Inbuilt Wi-Fi and NFC technology enables you to control the camera from a smartphone or tablet, or send your images across for quick sharing to social networks. There's a free Canon CameraConnect app which is available for iOS and Android. The supplied rechargeable Li-ion battery is quoted at a reasonably meagre 210 shots, or 320 shots if you switch to using Eco mode. During my testing, I found that the G5X lasted well throughout the day. I shot 178 images during the course of a day, making heavy use of the screen and Wi-Fi system and when I got home there was still a bar left on the battery life indicator. Of course, every day is likely to be different. This isn't a particularly high battery life and if you're likely to be spending some time away from a charging point, it may be worth investing in an extra battery.